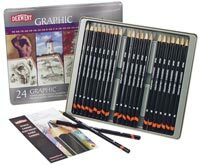 This 24-piece graphite pencil set contains a large variety of grades– enough to satisfy the needs of the designer and draftsperson. Includes: two each of grades HB, 2B, 4B and 2H pencils; and one each of the remaining sixteen grades (from 9B to 9H). The convenient tin keeps the pencils orderly for rapid selection. Starvin' Artist is an amazing custom picture framer that is also an art supply store in the Chicago area. When you are finally proud of your work, please consider a custom picture frame for your finished artwork.